In this classic of children's literature, beloved by generations of readers and listeners, the quiet poetry of the words and the gentle, lulling illustrations combine to make a perfect book for the end of the day. In a great green room, tucked away in bed, is a little bunny. "Goodnight room, goodnight moon." And to all the familiar things in the softly lit room—to the picture of the three little bears sitting on chairs, to the clocks and his socks, to the mittens and the kittens, to everything one by one—the little bunny says goodnight. 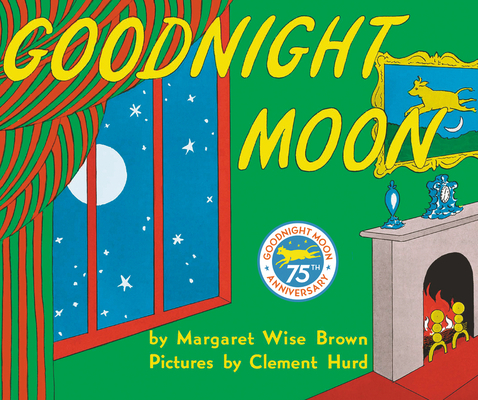 One of the most beloved books of all time, Goodnight Moon is a must for every bookshelf and a time-honored gift for baby showers and other special events. Margaret Wise Brown, cherished for her unique ability to convey a child’s experience and perspective of the world, transformed the landscape of children’s literature with such beloved classics as Goodnight Moon and The Runaway Bunny. Other perennial favorites by Ms. Brown include My World; Christmas in the Barn; The Dead Bird; North, South, East, West; and Good Day, Good Night. Clement Hurd (1908–1988) is best known for illustrating Goodnight Moon and The Runaway Bunny, the classic picture books by Margaret Wise Brown. He studied painting in Paris with Fernand Léger and others in the early 1930s. After his return to the United States in 1935, he began to work in children's books. He illustrated more than one hundred books, many of them with his wife, Edith Thacher Hurd, including the Johnny Lion books, The Day the Sun Danced, and The Merry Chase. A native of New York City, he lived most of his life in Vermont and California. Clement Hurd (1908–1988) se graduó de Yale University. Estudió pintura en París en los años 1930 con Fernand Léger, entre otros. Allí fue donde desarrolló su estilo característico, compuesto de colores de fuerte contraste. Hurd estuvo casado con la escritora Edith Thacher Hurd, con quien también creó muchos libros que se convirtieron en favoritos de los niños.